The international community is striving to substantially reduce the cost of remittance services. This effort began in the late-2000s, when the General Principles for International Remittance Services were issued by the World Bank and Bank for International Settlements, the so-called 5x5 objectives were adopted by the G8 and then by the G20, and many public and private sector initiatives were launched in this direction around the globe. Building on these efforts, the UN Sustainable Development Goals (SDGs) set a target for cost reduction that is two-fold. Firstly, the average cost of remittance services globally should be lower than 3% by 2030 (it now stands at 6.94%). Secondly, it should be possible to send remittances for a total cost of 5% or less in any given country-to-country corridor. The index developed by the World Bank to monitor this target, known as Smart Remitter Target (SmaRT), goes beyond just the cost of the service and includes accessibility, reach, and transfer speed in the equation. As of September 2018, 37% of corridors are above the 5% cost target. Trends in policies and regulations, as well as market conditions (including addressing the issue of shutting down correspondent banking relationships), will be critical in achieving SDG 10, the goal related to remittances. With an enabling market and policy environment, remittance service providers can focus on leveraging new technologies to further benefit senders and receivers. Innovative solutions are already beginning to shift the landscape of remittance services by reducing cost and increasing convenience for senders of remittances and their families. A study of mobile money remittances by GSMA (the trade association of mobile operators) found that mobile technology cuts remittance costs in half. 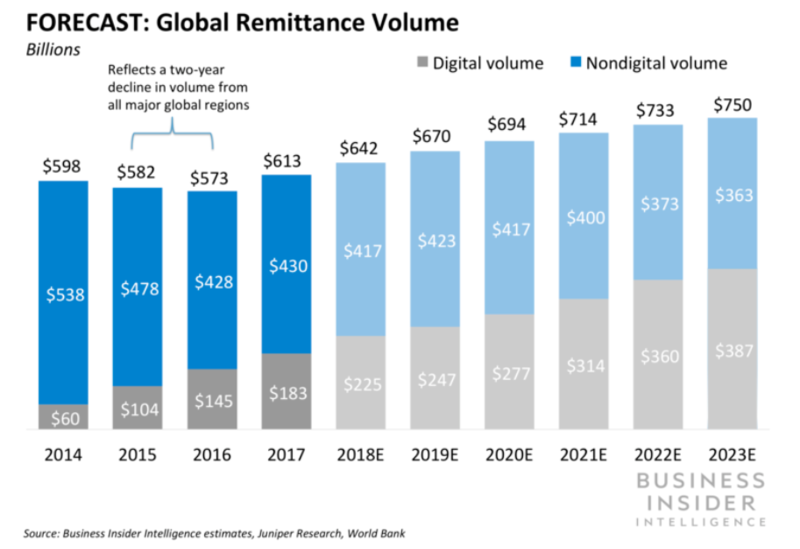 Similarly, research from PayPal and Xoom shows that the average cost of sending a digital remittance is just 3.93%, nearly half the cost of traditional remittances. In the same vein, a World Bank and Bank of Albania report estimated that if half of international remittances currently received in cash in Albania were received via e-money, beneficiaries could save up to $1.3 million annually while payment service providers could save up to $6.7 million. Technology can also help reduce the time and effort required to send and receive remittances. A Boston Consulting Group study of five emerging markets estimated that mobile financial services produce a savings of 1% of income due to reduced travel and wait times. The Xoom study estimated that digital remittances could save remittance recipients in Mexico 15 days over the course of their lives, nearly 100 million hours in aggregate for the economy and nearly $450 million in economic value based on the average income of a Mexican citizen. Research has demonstrated a positive correlation between increased remittances and enhanced formal deposits and credits. Another benefit of banking for remitters and receivers is government deposit insurance schemes, which help create enhanced trust and usage. Remitters who use account-based transfers send on average 30% more than those using more informal channels; these additional funds could yield enhanced stickiness with the regulated financial system for receivers in emerging markets. How can we reduce the cost of remittances? Can remittances reduce poverty more than aid? Innovative solutions must be complemented by additional efforts. While two-thirds of unbanked individuals around the world have access to a mobile phone, this is not sufficient to achieve universal financial access and usage. The World Bank Global Findex finds that a quarter of all new transaction accounts worldwide are 'inactive', meaning that there were no deposits or withdrawals made over the prior 12 months. - Strengthening domestic payment systems infrastructure and other supporting infrastructures such as IT, and ensuring remittance service providers can fully take advantage of them. Interoperability and fair and open access policies can directly impact the ability of remittance service providers to efficiently collect and distribute remittances. - Reviewing legal and regulatory frameworks to remove any barriers to the use of digital channels for remittances. Various requirements exist (identification, signature, forex controls) that prevent full digitalization of remittance services. Finally, consumer protections - such as ensuing customers understand products and are aware of risks, as well as protection of data, privacy and security when handling cash - are paramount to financial health. Educating and protecting the consumers is critical to gaining trust essential to drive healthy usage. This blog is part of a short series exploring the latest findings from the 2017 Global Findex database. The posts analyze various country cases and explore challenges in expanding financial inclusion.